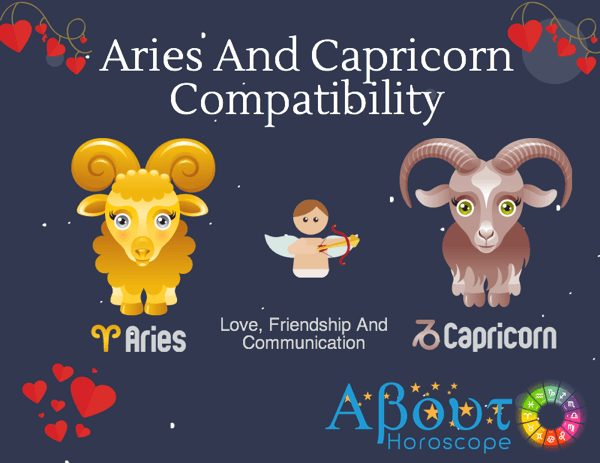 When Aries and Capricorn join together, adjustment and compromise is the key to successful match making. It will take many compromises and much patience for them to stay together. Their opinions and lifestyles have little in common. Capricorn is an earth sign – practical, grounded, and goal-oriented while Aries is a fire sign– enthusiastic, outgoing and generally adventurous with the burning desire to play and win in life. They are both driven by their life goals but differ in their ways of achieving those goals. One is impulsive, even reckless at times and the other is patient and practical. Another drawback is Capricorn finds it difficult to express about anything while Aries is one of the most expressive partners. A Capricorn in love requires patience, persistence, and most importantly time. Some Capricorns delay love by pouring their energies into their careers. Their life goals come first so impatient Aries must learn to accept and understand this because this relationship has the potential to be successful despite the difficulties. Both are looking for partners who are hard-working, who can appreciate tradition, and who will look forward to sharing the finer things in life. Capricorns are a wise choice for people looking for quality long-term relationships. Aries are not attracted to weak partners despite their reputation of being dominant. They typically do best with an equally feisty and confident lover. Capricorns are reliable, determined and faithful, making them valuable lovers and great assets in all of their various relationships. The first thing that will pique his interest is Capricorn woman’s timeless charm. She is the picture of grace—elegant, well-mannered, and socially appropriate. She will be drawn to his childlike appeal, innate confidence, courage and independence. They are seemingly so different at first…. but if these two will give a shot at it, they will be surprised at how well things turn out. A Capricorn woman in a relationship with an Aries man, gets a partner who teaches her to fly happily and freely which she never did before in her life. He sees each facet of life as a challenge and gives his best shot in order to win all the time. This attitude provides her with the sense security she longs for and makes him the right man whom she would love to honor and with all her life. The only prominent flaw in the personality of Capricorn woman is her self-centered attitude towards everything in life. But still, he always admires her wonderful attitude towards life and enjoys his freedom with her as much as she does. The Aries man and the Capricorn woman can have an interesting relationship when he is aware of her insecurities and when she does not try to make him feel inferior in any way through her intellect. Given Aries’ popularity among women, he will have to put in a lot of effort to prove his trustworthiness to win the Goat’s approval and affection. In time she will realize that beneath all his seemingly extroverted characteristics, he is trustworthy. Stability is earned by this couple over time as their love grows and all the trivial matters are left behind. As their selfless love blooms, they will exchange never ending affection and devotion, which makes them experience the heaven on earth. Nothing can be farther than the truth…….. love makes it all possible……and where love exists it does not leave space for anything else! The calm and composed Capricorn man appeals to the Aries woman. He may be driven by his ambitions but once he accepts a woman in his life, it is a serious thing for him. Initially she will feel that the he is slightly cold, detached and emotionally aloof. However, it is the Capricorn man’s way of protecting his emotions. The Capricorn Man takes a long time to open up, express his love and share his experiences. He finds her childlike innocence adorable. He is amused by her recklessness. He gives her undivided attention and takes her fiery personality very calmly through his patience and mild approach. Capricorn man loves the strong personality of his Aries lady love and gives her complete freedom to enjoy her adventures with little restrictions. However, Capricorn man is emotionally guarded, unlike straightforward Aries. If she is really into him, she has to give him enough reasons and time to trust her sincerity. As the time passes, Earth and Fire starts blending nicely to take this relationship to another level. When they manage to overcome their mutual unintentional selfishness with their deep love, nothing can separate them. Aries and Capricorns have a lot of common characteristics. Both of them are intelligent, motivated, and goal oriented. However, trouble brews because they having different approaches and ways of doing things. These differences can create conflicts in the otherwise smooth relationship.If this relationship is going to succeed there MUST be patience and the strong determination to make it work. Without these two vital elements- the magic will fizzle. Trouble really gets going when the two refuse to compromise- which could be often. The highly opinionated Aries may unintentionally hurt the feelings of sensitive Capricorn. This will affect the relationship even more because an Aries will stick to what he believes is right. Both of these signs will need to agree to disagree on conflicting issues to avoid relationship woes. Also, adjustments, agreements, and compromises are definitely needed to survive because Capricorns and Aries are exactly opposite. With patience and tolerance, the relationship can be a very long and meaningful one. To be able to live a life of happiness, Aries may need to abandon some of their aggressiveness and harsh nature. This simple action may help them to create a long lasting relationship with other signs. In all, Aries can be a strong other-half of an enduring relationship.